FULTON, NY – In recognition of October being Breast Cancer Awareness Month, the Cancer Services Program of the North Country, in collaboration with OCO Reproductive Health Services, will recognize Women’s Health Day with an open house at the Fulton Health Center, 522 S. Fourth St., Suite 500, in Fulton on October 27 from 8:30 a.m. to 12:30 p.m.
Oswego County Opportunities Healthcare Providers (from left) Dinah Olson, PA; Lisa SouSou, PA; and Heather Shannon, NP get their pink on in recognition of October being Breast Cancer Awareness Month. OCO will celebrate Women’s Health Day with an open house on October 27 at the Fulton Health Center. Community members will have the opportunity to tour the health center, meet OCO’s reproductive health providers, and learn more about the Reproductive Health Services program. Additionally, OCO health care providers will be offering, on site, clinical breast exams, pap/pelvic exams, and STD and HIV testing. Appointments can be made for OCO Reproductive Health by calling 315-598-4740. Operating under the auspices of Oswego County Opportunities the Cancer Services Program of the North Country offers mammograms, clinical breast exams and other cancer screenings including pap/pelvic exams, cervical cancer, and colorectal cancer for uninsured residents in Oswego, Lewis, Jefferson, and St. Lawrence counties. 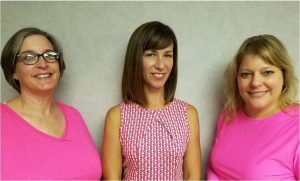 For more information on Breast Cancer Awareness Month or for eligibility requirements for the Cancer Services Program of the North Country contact Handville at 315-592-0830 or toll free at 855-592-0830. Visit the New York State Department of Health website for more information about breast cancer, including prevention, diagnosis, and treatment. Did you know? It’s OCO!